It's been difficult to motivate myself to blog about SeasonsBox this month. The company has moved to the U.S. with no communication to its subscribers (most did not know about the change) and service to Canada has been extremely delayed. I received my May SeasonsBox in early June and it took me a really long time (in blogger terms) to try the products, record the video, take the photos, and now (finally) to write the blog post. I've also been waiting to see if there would be an official communication about the recent changes (more about that later) but unfortunately no word on that yet. 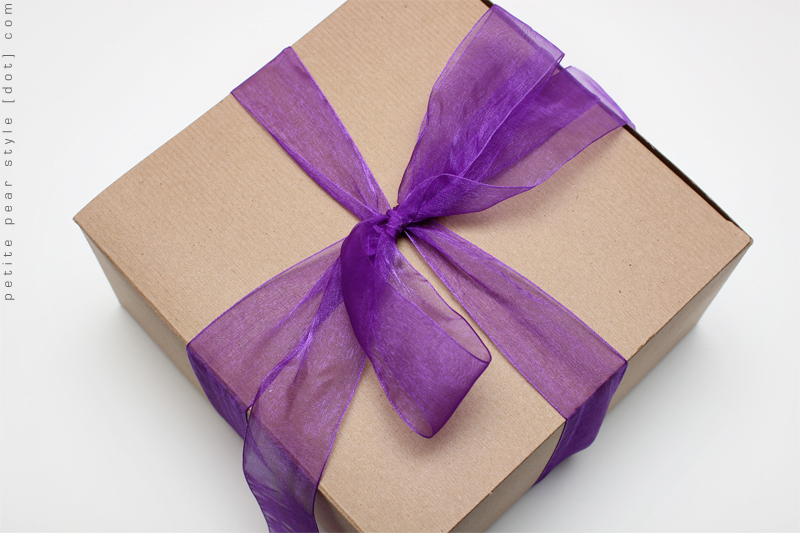 We received a purple organza ribbon this month. I didn't think I would like it when I saw it in the previews but it's actually really nice and I'll be able to reuse it for gift-giving. That being said, SeasonsBox is phasing out the inner box... I'm not sure of the timing but there will eventually only be the outer shipping box (which will have a customized SeasonsBox design on it). This change was quasi-announced through SeasonsBox's Facebook page, via a poll where you could vote for your favourite design for the shipping box. Deep Steep is a company based in South Carolina and we received a very generous full-size of the body wash. I wasn't too excited to receive this product because I have so many body washes in my collection I still need to use up. I do like the scent of lavender though so I will probably bump this up in my line-up of shower products. This product is free of parabens, sodium lauryl sulfate, mineral oil, artificial fragrances, and chemical preservatives. It is also vegan, cruelty free, and gluten free. This shade is from the Spring 2013 Sherbert Collection, which is great because I prefer to receive season appropriate nail polish shades from recent collections. I love the name of this shade because I see myself as a bit of a happy wanderer! :) I love this nail polish. It's a beautiful purple shade with a hint of a fuchsia shimmer. It applies very nicely and is opaque in 2-3 coats. Priti NYC nail polish is 5-free, vegan, cruelty free, and non-toxic. Gourmet Body Treats is based in Texas and uses only pure, non-toxic, and fair trade ingredients in its products. 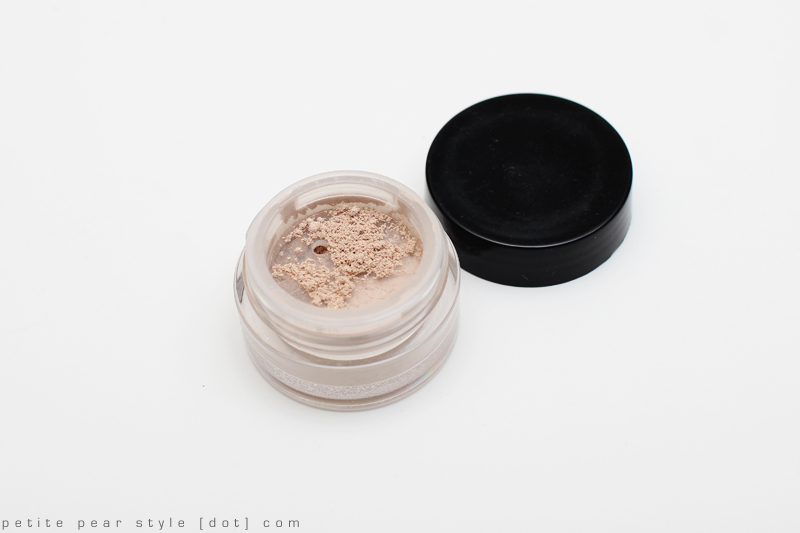 I received an eyeshadow in the shade island, which is a really neutral cream coloured shade. While not very exciting, I really like this type of shade because I find I get a lot of use out of it. I can use this shade as a base colour all over my eyelid and also as a highlight. I've used this bath bomb already and I really liked it! It smells great and fizzes beautifully in bath water. We received the rose bath bomb, which was featured in a recent issue of Vogue UK as a spring must-have. 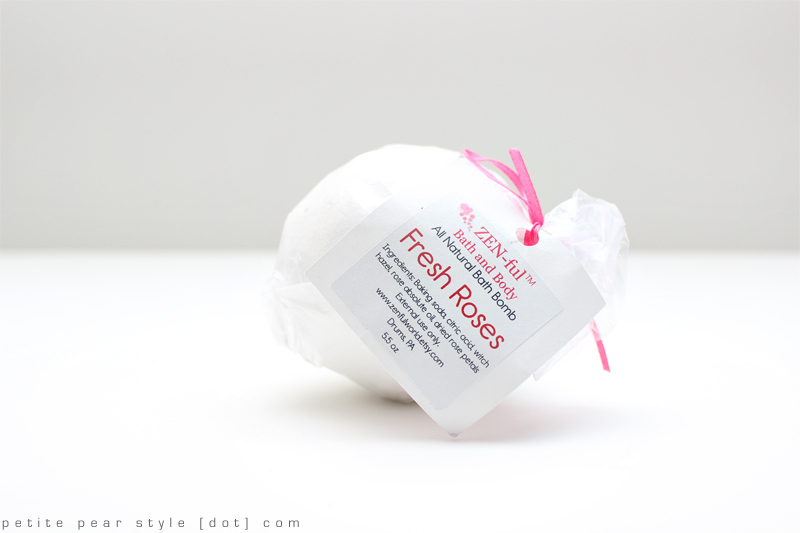 This bath bomb is handmade in Pennsylvania with grade A rose essential oil and organic rose buds. The SeasonsBox card also mentions that since rose petals are not very high in oil content, it takes several thousand pounds of rose petals to produce just one ounce of rose essential oil! Overall, while this was probably the least exciting box I've received to date, I actually ended up really liking the products I've tried so far. I like that SeasonsBox includes brands that I have never heard of and they are typically all responsible products you can feel good about using. While I do still like this subscription service, I am extremely disappointed by the lack of proactive communication from SeasonsBox. I feel like Canadian subscribers have been left in the dark about recent company changes, which are having a significant impact to our shipping dates. I strongly feel that good communication is a cornerstone of running a reputable business and hope that SeasonsBox will reach out to us soon. I received a shipping notification for the June box on the 14th but USPS did not receive the package until the 18th. 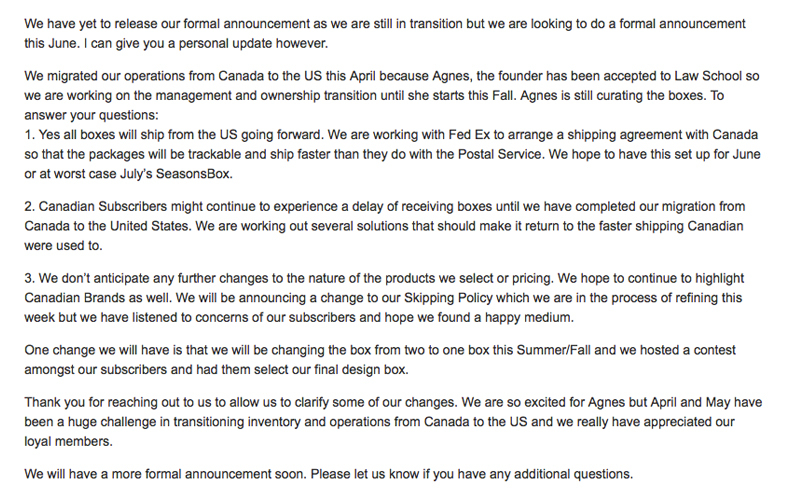 As of today, the parcel is still in the U.S. so it is unlikely I will be receiving the June box before July. That's disappointing that they didn't even tell subscribers anything. :/ I hope this one gets through the snags though because it looks like one of the nicer subs available. i hope so too! i do enjoy the products but customer service is so important. what?? that is really bad. i'd love to have three of those scarves though haha. hope it gets sorted out soon.